The founder of London-based gaming website Betonsports has been arrested and sent to the US to answer criminal charges, US officials have said. Gary Stephen Kaplan was arrested in the Dominican Republic on Wednesday. In June, Mr Kaplan was one of 11 people indicted on charges of racketeering, fraud, tax evasion and conspiracy. Betonsports closed down its US operations in August 2006. The US had been the group's biggest market, delivering around 95% of its profits. Following his arrest at a hotel in Santo Domingo, Mr Kaplan was sent by Dominican authorities to Puerto Rico for an initial appearance before a US magistrate. Authorities have asked that Mr Kaplan be moved to St Louis immediately or be held in custody pending a hearing to remove him to St Louis, to answer the charges against him. Mr Kaplan is the second person to be arrested in the investigation against Betonsports. In July last year the company's then chief executive David Carruthers was detained while changing planes in the US. He was later sacked by the company, which subsequently decided to shut down its US business. He has been held under house arrest in St Louis since August. 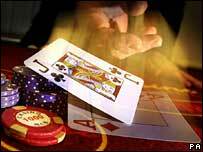 The arrests are widely seen as part of a US crackdown on online gaming. In October, President George W Bush signed the Unlawful Internet Gambling Enforcement Act - making it, in effect, illegal for firms to collect money there. As a result a number of firms - including 888.com and Sportingbet, Gibraltar-based Partygaming - withdrew from the US and turned their focus to other countries. However, the latest arrest comes as the World Trade Organisation has ruled against America's online gaming ban. The WTO said the US could only continue to block such websites if its laws were equally applied to US firms that offer off-track betting on horse racing. The US government argues it simply wants to limit gambling, however, overseas companies claim the US move is simply protectionism and means to remove foreign competition.